Airplane toilets can unleash hell, just as they can dispose of it. And Andy Cohen, wearer of dashing suits and host of Bravo TV's Watch What Happens Live, learned this hard truth when his flight flew dangerously close to the sun with a big problem in its lavatory. Cohen was flying to Nice, France from JFK in New York, but his Delta flight wound up turning around three hours after taking off Wednesday evening and headed straight back from whence it came. The reason? A broken toilet, which got Cohen fuming about the ordeal on his Instagram story, where he regaled his audience of the situation and lambasted whoever was responsible: "We were an hour outside of Europe, somebody pooped or put something down the toilet that didn't go, broke the toilets. Guess where we are? Back at JFK,” Cohen said, per the Daily Mail. The flight was forced to turn around while gliding over the Atlantic, because there was more staff at JFK capable of fixing the toilet than at the airport in France. In his story, Cohen made multiple requests for the culprit to come forward and atone for their behavior in the bathroom, but no such charlatan fessed up to the egregiously stupid act. Delta provided a statement about the 180-degree, round-trip flight, writing: "Delta apologizes to our customers for the inconvenience after Delta flight 412 to Nice, France returned to John F. Kennedy International Airport after the crew received an indication that the lavatories were inoperative. The flight landed without incident and the aircraft proceeded to the gate for maintenance inspection. Customers have been re-accommodated on an alternate flight and were offered a gesture of service recovery for the disruption to their travel." "No joke, I want to find this guy," he said. "I think they should sacrifice themselves at the beginning of the flight and make themselves known." 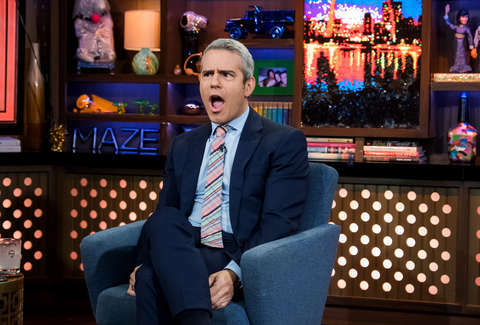 But when it comes down to what matters, the celebrity got his vacation to the south of France, so you can fall into a deep slumber tonight knowing all is well in the world... at least for Andy Cohen.